Product #46255 | SKU WMX2-512GB | 0.0 (no ratings yet) Thanks for your rating! 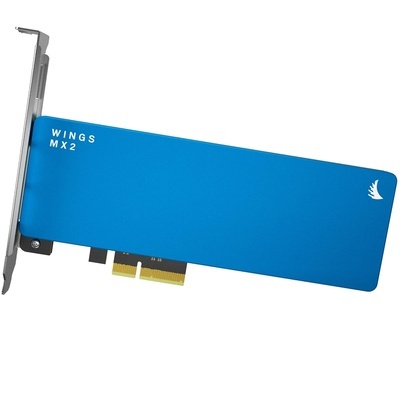 Upgrade your system's performance and storage with the Wings MX2 512GB PCIe x2 M.2 SSD from Angelbird . This solid state drive features a M.2 form factor and instals easily into any PCI-E x2 slot with no drivers required. Additionally, it is compatible with Mac, Windows, and Linux systems and is BIOS, EFI, and UEFI bootable. Outperforming standard SATA connected hard drives, the Wings MX2 delivers read speeds of up to 920 MB/s and write speeds of up to 900 MB/s. With no moving parts in the Wings MX2 solid state drive, you'll be able to experience cooler, quieter, and more energy efficient operation, especially when compared to traditional mechanical hard disk drives.